VisibleBanking.com’s Christophe Langlois was invited to join the line up of keynote speakers at the Financial Services Forum’s European Executive Summit 2014 and discuss the business impact of social media on customer experience. 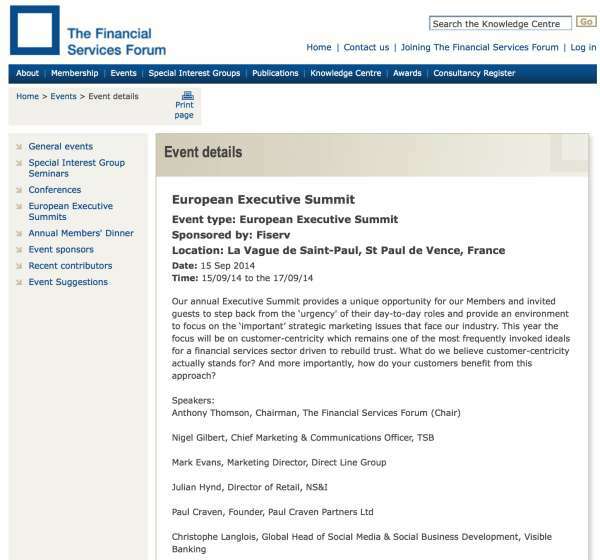 Following a few successful speaking engagements with them over the years, the Financial Services Forum invited me to contribute to the success of their European Executive Summit 2014 (15-17 September, France). I will share my personal views on the importance of social business in financial services and the business impact of social media on the customer experience. The Financial Services Forum invites only senior industry executives to ensure that we have a strong and relevant peer group. It includes CEOs, Marketing Directors, Strategy Directors, Customer Experience Directors and invited guests from outside the financial services industry. This year’s event is focusing on the strategic marketing challenges and opportunities in developing strong, differentiated customer experiences, through multi-channels. We will discuss the key topic of customer-centricity which remains one of the most frequently invoked ideals for a financial services sector driven to rebuild trust. What do we believe customer-centricity actually stands for? And more importantly, how do your customers benefit from this approach? The delegates are coming from a broad range of financial institutions including, but not limited to: AEGON Direct Marketing, AXA Insurance, Bank of Ireland, Citibank International plc, Co-operative Insurance, Coutts and Co, Direct Line Group, Franklin Templeton, Invesco Perpetual, Just Retirement, Moneysupermarket.com, Saffron Building Society, Skandia Investment Management, Schroders, Sun Life Direct, and Tesco Bank. Do you plan to attend the Financial Services Forum’s European Executive Summit 2014 in the gorgeous South-East of France? If you do, I look forward to meeting you in person in mid-September. And if you don’t, I invite you to still connect with the top keynote speakers on LinkedIn or twitter.